Sponsorship measurement firm FanLab says that official sponsors of the 2010 World Cup received substantially higher fan recall than official sponsors of the National Football League, according to a new survey by the firm. 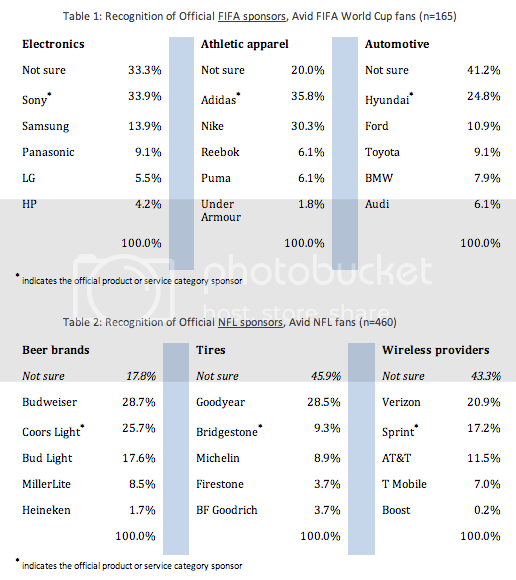 In two separate studies, fans of each sport were presented with three business categories and asked to select the official sponsor. In each of the categories presented to World Cup fans, the official sponsor was chosen most often. In the NFL study, the official sponsor was not recognized most frequently in any of the three categories surveyed. The categories selected and the results from the study are shown below. The World Cup study was conducted in July immediately following the World Cup, while the NFL study was conducted in February 2010.